first: did you enter this giveaway?? *UPDATE MAY 20 | GUESS WHAT - THIS PROJECT IS FULL!!! i'm going to have to cap the participants because at this point the project is going to take six months to a year! i'm so excited to do this with all of you and hopefully it won't be the last one! lula from lulapalooza was so kind to debut this awesome project for me! i'm really excited to do this! Such an awesome idea!!! :D I want to join in! Love the idea! I am so in!!! haha Emailing you right now!!! what a great idea! I'm a new follower! love it! Found you through Lula... 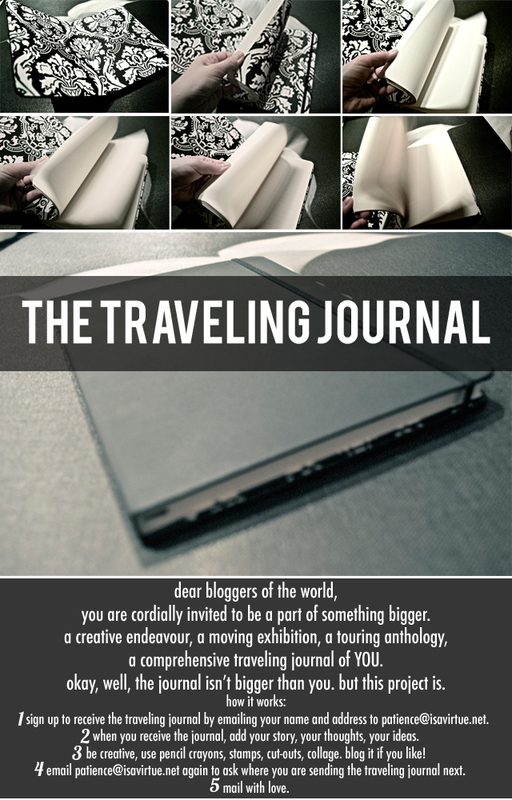 I just e-mailed you be apart of the traveling journal!!! That's the most awesome idea EVER!!! Wish I'd thought of it. Oh my gosh this is an amazing idea! I'm definitely signing up!! I love this! I've just signed up, and cannot WAIT! I'm also going to feature this on my blog. Love it, did I already say that? It's a beautiful idea, good luck!